CARLTON'S interest in international players has extended to the United States, with the Blues signing college basketballer Matt Korcheck as a category B rookie on a two-year contract. Already with three Irish players on their list – Zach Tuohy, Ciaran Sheehan and Ciaran Byrne – the Blues have added Korcheck, a 208cm, 105kg big man who played basketball at division one college Arizona. 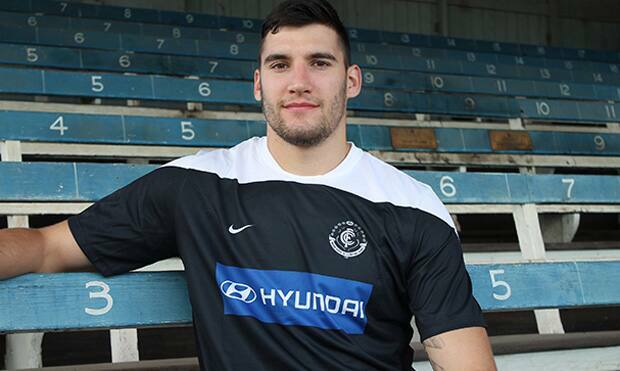 List manager Stephen Silvagni described Korcheck as a "beast of an athlete". "Matt is a beast of an athlete and showed some real promise when he made the journey over in August, so we're delighted to have the chance to explore that potential further," list manager Stephen Silvagni said in a statement. "He’s a strongly built and quite powerful athlete, so when you couple that with his 208cm frame, the possibilities are endless in his development." The American instantly becomes the tallest player on the Blues' list. Korcheck caught the eye of recruiters at a Florida screening camp in April this year before spending three weeks training with the Blues in August. He was only introduced to football a few months ago, but already has a favourite part of the sport. "Tackling is my favourite part of the game. I love the physicality of the sport, the conditioning and just how hard the players have to push themselves," Korcheck said. The American is set to arrive at Ikon Park in November to start pre-season training when the team returns from leave. Korcheck joins St Kilda's Jason Holmes, Collingwood's Mason Cox and North Melbourne's Eric Wallace as the players originating from the United States.